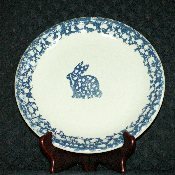 We are pleased to offer these simply marvelous Tienshan Blue Sponge Animal Rabbits Dinner Plates. This Tienshan Blue Sponge Animal Rabbits Dinner Plates features a deep blue sponged mottled rim, with a rabbit as the focal point in the center. The Tienshan Blue Sponge Animal collection is both Microwave and dishwasher safe and can easily make the transition from Oven to Table. Each available Tienshan Blue Sponge Animal Rabbits Dinner Plates is in Excellent Condition with no chips, cracks, crazing or yellowing. The graphics are crisp, the colors vibrant, the glazing smooth. The bottom of the Tienshan Blue Sponge Animal Rabbits Dinner Plates are marked with; " Folk Craft TM, Animals, by Tienshan, Made in China"
The Tienshan Blue Sponge Animal Rabbits Dinner Plates measure 10-3/8 inches in diameter.